Its name sounds like a cry of a forlorn hunter, or perhaps some kind of military ordnance, but Scattery Island or Inis Cathaig, in the Shannon estuary, is far from being forlorn. Yes, it has been uninhabited since 1978, but it has had an illustrious history. It was home to a monastic settlement for 600 years, it was plundered in numerous Viking raids, and at its peak was home to 141 people. Last month Scattery Island was named as Irish winner of the 2017 European Destination of Excellence (Eden). And edenic it truly is. Located 2.5km off Kilrush, Co Clare, it is a haven of peace and tranquility. Not too far from the mainland to be isolated but enough out to sea for you to stand in awe of the mighty Atlantic crashing on its western shore, the impact of Hurricane Ophelia a few weeks ago would have been immense. Scattery Island inhabitants earned a reputation as river pilots, guiding ships up stream to Limerick. But it was a hazardous occupation and many drowned directing larger vessels to the city through treacherous currents. Today, its beaches bear testimony to those times with constant flotsam and jetsam cast ashore by turbulent seas; an old crate here, a ship’s beam there. The last people to leave the island were Patty McMahon and her brother Austin who departed its shingle shores in 1978. However, the remnant signs of a community are still there. The old post box built into a house front is still there. A row of houses with a distinct road in front of them has the character of village life. Here, sheltered from the wild Atlantic to the east, lived Brennans, Melicans, Scanlans, McMahons, Costelloes, Hehirs, Morans, and Griffins. In addition to the river navigation the islanders got by through subsistence farming and fishing. For an island of just 180 acres it has a fascinating history. Its name is reputedly derived from the Norse word for treasure, scatty, or alternatively comes from a mythical sea monster. In the 1oth century Scattery was under the control of the Viking ruler Ivar of Limerick who was killed on the island by Brian Boru in 977. Peter Somerville Large in the authoritative Ireland’s Islands speculates that the Viking settlement on Scattery predates that of Limerick and that it was used as a base for raids up and down the coast. The notion of the island as a base for the Viking’s loot is underscored by the discovery of two silver Viking brooches. They can be seen in the British Museum. Truly a treasure island. It is something of a mini-Rome or Canterbury in its own right, with no less than 11 churches in various states of disrepair testament to the spiritual leanings of its former inhabitants. It also has a round tower, one of only about 20 in the country in near perfect condition. St Senan founded a monastery on the island in the 6th century. 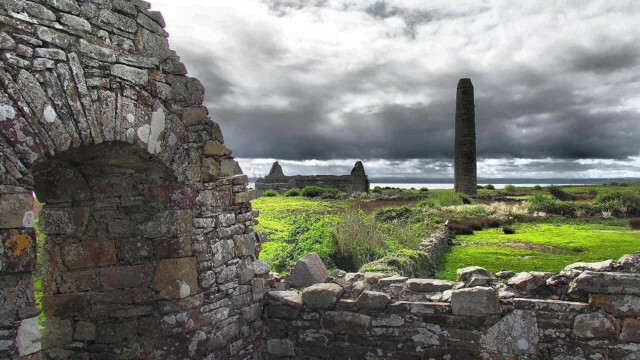 It lasted until the 12th century — a timeframe which also encapsulated the life of the Skellig monastery in Co Kerry. St Senan’s bell also adorns the British Museum’s Irish collection and was plundered by the 19th century ‘collector’ TL Cooke in the 1850s. Scattery also plays an important part in geopolitical history. At the mouth of the River Shannon it was a a major strategic point, as attested by the Viking interest from 1,000 years before. During the Napoleonic wars Scattery was chosen by the British to build a defensive battery to counter any attempted French invasion. Okay, so you’re not interested in religious monuments or military history. Take a stroll to the far side of the island past the post office on the ‘street’. A lone heron glides on to the roof of a Famine house. If you thought you’d seen the last of human activity you’d be wrong. A magnificent lighthouse, unoccupied of course, stands at the eastern part of the island directing ships away from the rocky foreshore. From here, it is possible to walk around the rest of the island, and return, unfortunately, to the ferry. How to get there. Ferries leave daily from Kilrush, Co Clare, in the summer season. Other: An OPW office on the pier records the history of the island.